Is This The Self-Portrait Of The Future? This is a photo of "21st Century Self-Portrait" by Joshua Harker, made using a 3D scan of his face and a CT scan of his skull. 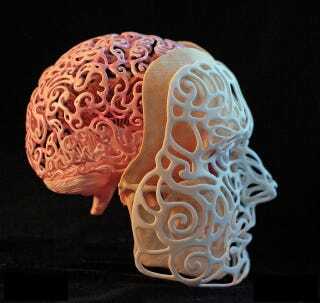 From there, he used a 3D printer and his own filigree style to create this sculpture. Harker even allows you to order a version for yourself, using a 3D scan of your own face at his website. Who wants one?